Jingle Bell, Jingle Bell Rock, Jingle Bell Rocks – The holiday season is in full swing. I know everyone gets super busy this time of year and things can get stressful. Try to take some time for yourself and remember to breathe. 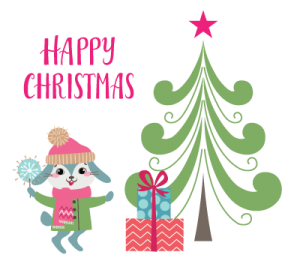 Raspberry Moon will be closed from December 22 to December 27 – Mom, Douglas and I are traveling to PA to hang out with Nana and the family. I will be in the shop on the 28th and then closed again Dec 29 to Jan 2. However, if you need a gift certificate, you can purchase them online at your convenience at www.RaspberryMoonST.com. Thank you to everyone that has supported Raspberry Moon this year. It has been an amazing year and I love being able to do work I enjoy and spend time with fabulous people every day. Please be safe and enjoy your holiday, or if you are unfestive this time of the year and just want to bury your head in the sand, do things that you love – rest, read a book or two, binge watch something funny (I love the The Marvelous Mrs. Maisel on Amazon! Foul language but hilarious), go hiking or whatever works for you that you never have time to do because life is busy. If you have some time tonight and want to experience a different kind of shopping adventure, be sure to stop by the shop from 5 to 7ish and have fun at different stations set up throughout the shop. 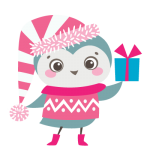 Great gift opportunities for a few people on your list or for yourself. We’re doing something a little different this year. Don’t just look at what all we have to offer for you and your loved ones, experience them! Pick the perfect Holiday Red – I love our Besame Lipsticks! This is your opportunity to try different shades and find your perfect red. You can do a little lip exfoliation first from our lip duo kit before finding the shade for you. Cleanser, Serums, Moisturizers, Oh My – What do I need for my skin to look and feel its best? We’ll have a Tester Station for our skin care, with kits small and large ready for gift giving (or buying for yourself). Skin Script Aroma Bar with our facial treatment enzymes and masks with cards describing the benefits and uses for each. Skin Script smells amazing, and as these products aren’t available outside of a facial service we don’t usually have them on tap as testers. Experience them for yourself and we’ll help you figure out the best ones for you and/or a loved one to use the next time you’re in for a facial treatment. Fast Fix for Rough Hands – Try the Skin Script Retinol scrub as a hand treatment and then try our fabulous hand lotion. Holidays Got You Frazzled? Let us help put you together with our 5 and 10 minute prep station for a perfect holiday glow. And of course we’ll have special event pricing, some grab bag deals, and some sercies! Holiday memories come to life through spicy scents of the holidays. This Pear and Frankincense Facial is designed to relax us, yet hydrate our skin with 5% Lactic and all the benefits of the Winter Complex including the use of (1) the DermaPep peptide with retinoic effects to stimulate collagen and reduce photo-damage, (2) the ayurvedic plant Indian Senna to hydrate dry skin, and (3) the Mirabilis Jalapa Flower to soothe sensitive skin. We also incorporated Pinolumin which is a concentrated extract of Swiss stone pine (trees) that calms skin hypersensitivity and reduces skin redness. 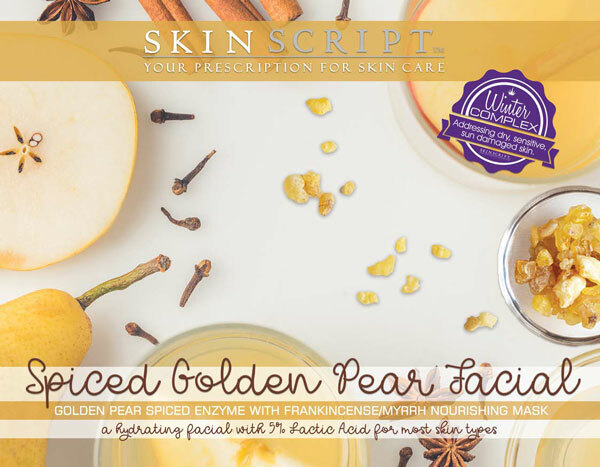 Golden Pear Spiced Enzyme: This pear puree has a moisturizing effect on the skin through its pectin and 5% Lactic Acid. It also has the benefits of the Winter Complex including the use of (1) the DermaPep peptide with retinoic effects to stimulate collagen and reduce photo-damage, (2) the ayurvedic plant Indian Senna to hydrate dry skin, and (3) the Mirabilis Jalapa Flower to soothe sensitive skin. We also incorporated Pinolumin which is a concentrated extract of Swiss stone pine (trees) that calms skin hypersensitivity and reduces skin redness. Frankincense/Myrrh Nourishing Mask: This creamy, hydrating mask contains Frankincense and Myrrh oils from tree resin/sap that have anti-inflammatory properties. Clove oil is an antioxidant and also provides antibacterial properties. Included in this mask are the benefits of the Winter Complex including the use of (1) the DermaPep peptide with retinoic effects to stimulate collagen and reduce photo-damage, (2) the ayurvedic plant Indian Senna to hydrate dry skin, and (3) the Mirabilis Jalapa Flower to soothe sensitive skin. Want to really channel your inner Santa Baby? Upgrade to one of the Glitz and Glimmer Masks. These masks are the latest trend in Korea. They are an Ultra-nourishing gel-type modeling mask for party-ready skin in minutes. 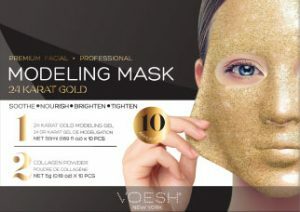 Gold Glitz and Glimmer Mask is made with real 24 Karat Gold, ginger and berry extracts to brighten and tighten skin. Silver Glitz and Glimmer Mask is made with Pearl, rice and honey extracts to purify and nourish skin. These can be added to your customized facial for an additional $15. You will experience all the nourish benefits of our one hour Facial Treatment which includes facial cleansing, exfoliation, steam towels, extractions, and massage followed by your treatment mask. 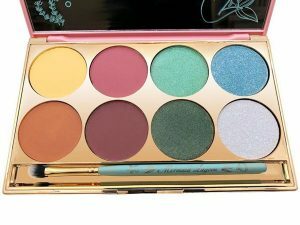 To celebrate the 65th anniversary of Walt Disney’s classic film “Peter Pan,” Bésame has collaborated with Disney to create this collection, inspired by the enchanting, dreamy mermaids of the Neverland Lagoon. Super excited to have a limited number of this collection available for you. Sets your makeup, but also creates a refined and polished finish to correct the tiniest complexion flaws. The translucent appearance includes a subtle texture that shimmers like the pearls in the lagoon. The powder, embossed with mermaid tails and oceanic swirls, is packaged in a custom-designed shell. This silky-soft matte bronzer, inspired by the expansive sands of Mermaid Lagoon, reflects the relaxing joy of basking in the sun. This milk chocolate powder can be used as a soft blush or contour on lighter skins tones, and a blending powder for darker skin tones. The powder, embossed with mermaid tails and oceanic swirls, is packaged in a custom-designed shell. Mermaid Kiss – This sheer, shimmer lipstick is artfully designed to be worn either by itself, or as a shimmer topper over your favorite Bésame lipstick. The glossy pearl finish is long-lasting and infused with lip-loving ingredients. It can also be applied to your cheeks or eyelids for a lightly frosted pearlescent effect. Flavored with delicious vanilla, the shimmer of this lipstick is sure to elevate your look. Starfish Pink – This muted pink lipstick, the same shade used by the Mermaids of Mermaid Lagoon, elegantly evokes the beachside lifestyle of the 1950s. The natural, deep pink shade makes Starfish Pink wearable every day. The satin-finish, highly pigmented color will look beautiful on any skin tone. Water Lilly Blossom Red – This dreamy, pink-based, medium tone red lipstick takes its color faithfully from the ink and paint used for the Mermaids in Mermaid Lagoon. The satin-finish highly pigmented color will look beautiful on any skin tone. This special edition shadow palette from our 1953 Collection draws all of its colors and designs directly from the Ink and Paint cels of Mermaid Lagoon. These luxurious shadows provide an exciting array of choices and looks that draw inspiration from the tranquil and carefree ambience of the lagoon. The names of the colors refer to the original names of the actual paints used by the animators. The painted wood handle brush included has a flat, rounded top, and is created from the finest, softest, man-made hair. Inspired by the waterfall in Mermaid Lagoon, the first ever Bésame limited edition fragrance evokes a day spent relaxing by a secluded waterfall. The fresh seawater scent transports you to the enchanting lagoon of Neverland, where waterfalls cascade and rejuvenate the senses. 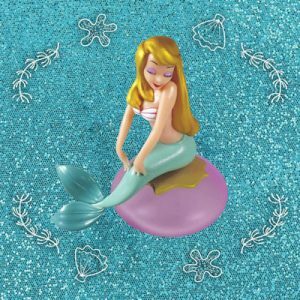 The bottle features an exquisite, hand-painted Mermaid figurine seated atop her glass perch, which is taken directly from the animation archives at Disney and digitally recreated in a stunning 3D model. All licensed collections are final sale. Discounts do not apply to licensed collections.